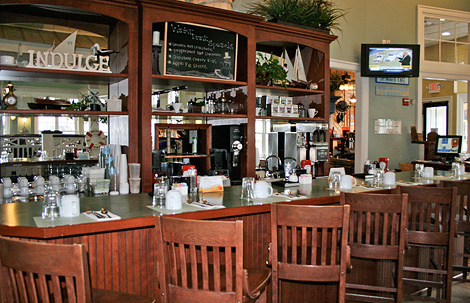 The Turning Point breakfast brunch and lunch started in 1998 in Little Silver, New Jersey. We pride ourselves on offering the highest quality and freshest daytime meals in the area. Every menu item we sell is made from ‘scratch’ soups, dressings, salsa ect. We crack hundreds of eggs a day because we know it’s the best thing for our customers. Every item on our menu is cooked to order… to your requests. We will make it how you like just give us a little time. Our philosophy is “fresh is always best”. The atmosphere at our restaurants is comfortable and relaxing. We apply the same principles of a nighttime restaurant to our daytime breakfast and lunch establishments. Our restaurant’s interiors are decorated tastefully with natural wood floors, bright traditional colors and real plants, creating a pleasant dining room. The staff is committed to providing a 100% satisfied dining experience. We hire friendly people first and then train them to be servers and baristas. If you are looking for a unique breakfast or lunch restaurant come give The Turning Point a try. You will be glad you did!